Jan Vermeer, one of the greatest Dutch masters, is responsible for some of the most iconic imagery in the history of art, such as The Girl with a Pearl Earring (ca.1665), The Milkmaid (ca. 1660) and The Art of Painting (1665-1668). His artworks are a rarity, with only around 36 known paintings attributed to him. 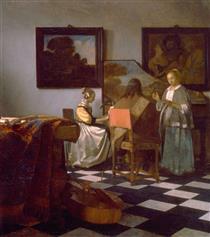 Much of Vermeer’s life remains a mystery, which makes him and his paintings all the more captivating and intriguing. Jan Vermeer was born in 1632 in Delft. His father was a weaver, who was also registered as an art dealer in the Delft Saint Luke’s Guild in 1631. Very little is known about Vermeer’s early education and why he decided to pursue a career as a painter, but in December 1653 he was registered as a master painter in the Saint Luke’s Guild. In the same year, he also married Catharina Bolnes. His mother in-law, Maria Thins, possessed a moderate collection of paintings by the Utrecht Caravaggisti, painters that were profoundly influenced by the art of Caravaggio. 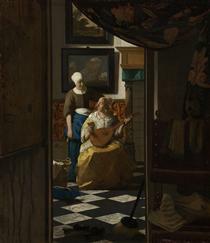 This influence was a factor in the development of Vermeer’s early style in biblical and mythological paintings, like Christ in the House of Martha and Mary (1654) and Saint Praxedis (ca. 1655). In the latter part of the 1650s, Vermeer gradually switched to genre painting, that depicted intimate scenes of domestic life. His most famous paintings were interior scenes of young women engaged in reading and writing, playing musical instruments and doing domestic work. In Young Woman with a Water Pitcher (ca. 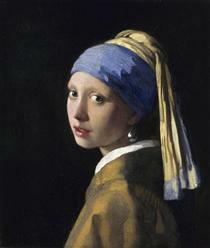 1662-1665), Vermeer demonstrated his mastery of light and texture. 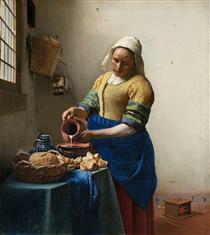 In the quiet scene, Vermeer expressed the beauty and harmony found in everyday objects and activities. By the 1660s, Vermeer was an established artist, and he was selected to serve as one of the heads of the Saint Luke’s Guild in 1662-1663. During his career, the artist showed interest in camera obscura, an optical tool that could project imagery on a flat surface. Some have argued that this interest extended into his method of painting, and that he used the device to plan the arrangements of his compositions. In 1671-1672, Vermeer was once again selected to serve as head of the Delft Saint Luke’s Guild. Despite being well respected within Delft’s artistic community, Vermeer fell into financial peril towards the end of his life. He died in 1675 in Delft, leaving his wife and children with enormous debt. Because he only garnered moderate success and encountered unfortunate circumstances at the end of his life, Vermeer was largely forgotten by history. However, this all changed in the 19th century, mostly due to the work of French art critic, Théophile Thoré-Bürger. 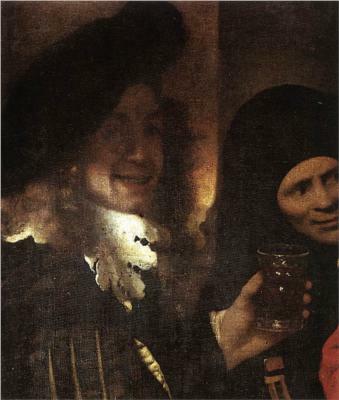 Thoré-Bürger’s efforts to identify Vermeer’s paintings, and the admiration he expressed for Vermeer in his writings piqued the interest of the broader public. The famous French novelist Marcel Proust even featured Vermeer’s View on Delft (ca. 1660-1661) in his novel In Search of Lost Time. All these were indicative of the rediscovery of Vermeer’s art, that forever lamented his place in art history. Johannes Vermeer (/vərˈmɪər/; Dutch: [joːˈɦɑnəs vərˈmeːr]; October 1632 – December 1675) was a Dutch painter who specialized in domestic interior scenes of middle-class life. He was a moderately successful provincial genre painter in his lifetime but evidently was not wealthy, leaving his wife and children in debt at his death, perhaps because he produced relatively few paintings. Johannes Vermeer was baptized in the Reformed Church on 31 October 1632. His father Reijnier Janszoon was a middle-class worker of silk or caffa (a mixture of silk and cotton or wool). As an apprentice in Amsterdam, Reijnier lived on fashionable Sint Antoniesbreestraat, a street with many resident painters at the time. In 1615, he married Digna Baltus. The couple moved to Delft and had a daughter named Geertruy who was baptized in 1620. In 1625, Reijnier was involved in a fight with a soldier named Willem van Bylandt who died from his wounds five months later. Around this time, Reijnier began dealing in paintings. In 1631, he leased an inn, which he called "The Flying Fox". In 1635, he lived on Voldersgracht 25 or 26. In 1641, he bought a larger inn on the market square, named after the Flemish town "Mechelen". The acquisition of the inn constituted a considerable financial burden. 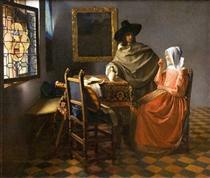 When Vermeer's father died in October 1652, Vermeer took over the operation of the family's art business. In April 1653, Johannes Reijniersz Vermeer married a Catholic girl, Catharina Bolenes (Bolnes). The blessing took place in the quiet nearby village of Schipluiden. 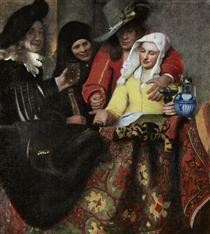 Vermeer's new mother-in-law Maria Thins was significantly wealthier than he, and it was probably she who insisted that Vermeer convert to Catholicism before the marriage on 5 April. According to art historian Walter Liedtke, Vermeer's conversion seems to have been made with conviction. His painting The Allegory of Faith, made between 1670 and 1672, placed less emphasis on the artists’ usual naturalistic concerns and more on symbolic religious applications, including the sacrament of the Eucharist. Walter Liedtke in Dutch Paintings in the Metropolitan Museum of Art suggests that it was made for a learned and devout Catholic patron, perhaps for his schuilkerk, or "hidden church". At some point, the couple moved in with Catharina's mother, who lived in a rather spacious house at Oude Langendijk, almost next to a hidden Jesuit church. Here Vermeer lived for the rest of his life, producing paintings in the front room on the second floor. His wife gave birth to 15 children, four of whom were buried before being baptized, but were registered as "child of Johan Vermeer". The names of 10 of Vermeer's children are known from wills written by relatives: Maertge, Elisabeth, Cornelia, Aleydis, Beatrix, Johannes, Gertruyd, Franciscus, Catharina, and Ignatius. Several of these names carry a religious connotation, and the youngest (Ignatius) was likely named after the founder of the Jesuit order.